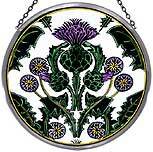 The Thistle Nouveau is a striking design by Alphonse Mucha who was an illustrative Czech artist in the early 1900's. His style became known as Art Nouveau. Often imitated, his style is still extremely popular and recognizable today.